A photo of a substance found flowing out of storm drains into the Charles River on Saturday. 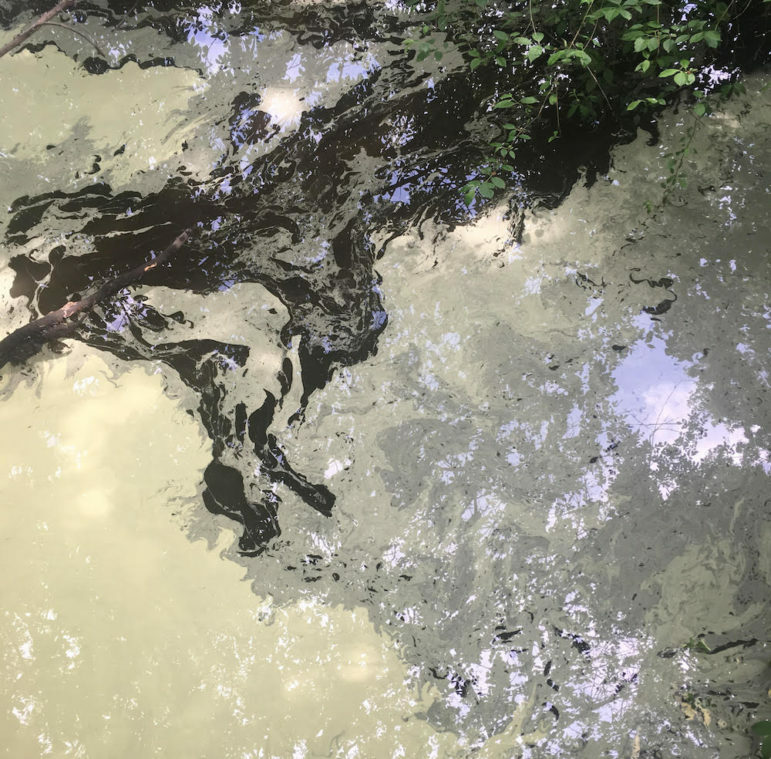 A Watertown resident caught on video a strange looking substance flowing out of storm drains into the Charles River on June 2. He could not identify what it was and was frustrated by efforts to report the outflow. The resident, David, lives near the Charles River and spotted the floating, beige or yellowish substance in the water Saturday afternoon. See video below. “It was a dark color and was floating on the surface of the water,” David said. The substance was coming out of two of the storm drain pipes and going the water. He did not think it was pollen because it clumped together more like an oily substance or possibly paint. It did not have a strong smell. David looked down Pleasant Street to see if anything had been dumped into the storm drain grates, but found nothing. He also tried to call the number on the outflow to contact the Department of Public Works to report the possible spill. “It rang for several minutes and it was obvious no one would pick up,” David said. He then called the Watertown Police, but was told that because the Charles River is controlled by the state he had to contact the Massachusetts State Police. “They said they would report it to the DCR (Department of Conservation and Recreation),” David said. There was a lot of greenish-yellow oily substance on the roof of the building next to us yesterday, too.